The racing future of tough stayer Pentathlon is in doubt after the seven-year-old pulled up a bit scratchy following his sixth-placing in the Egmont Cup (2100m) earlier this month. The son of Pentire has banked $400,000 in prizemoney and proved competitive in some of Australasia’s feature staying races including placings in the Gr.2 Wellington Cup (3200m), Gr.2 Moonee Valley Gold Cup (2500m), Gr.3 Lexus Stakes (2500m) and Gr.3 New Zealand Cup (3200m). “I got him x-rayed after Hawera and he was just a bit scratchy and there are some changes in a fetlock joint,” Wheeler said. “Within four days he has come right and is working soundly again. I am just marking time with him. I am definitely not going to Melbourne with him and I am definitely not going to the New Zealand Cup. “I would hate for him to break down as he is such a neat horse and he will make someone a great hack. Wheeler said he would refrain from turning Pentathlon out for another spell because he is such a good-doing horse. “He’s the most relaxed horse you would ever see, and he just eats. It takes a long time to get him back to fitness. Meanwhile, Wheeler is likely to be represented at the New Zealand Cup carnival by progressive four-year-olds Abacus and Irish Flame. Abacus romped to a five-length success at Trentham last Saturday over 1 3⁄8 m.
“I wasn’t at all surprised, he had been working well,” Wheeler said. “He was ridden perfectly by Jason (Waddell) and I will probably take him down for the grade races at Riccarton and see where we go from there. Irish Flame finished runner-up at Trentham over a mile behind Guineas bound three-year-old Sir Nate and will also head south. 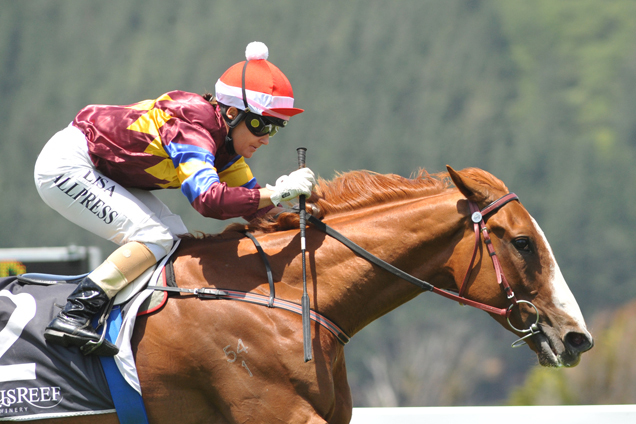 “He will go to Christchurch as well for the grade races down there and he is going super,” Wheeler said.